An unprecedented, one-day, global online event, SAP Hybris Digital Summit, will deliver rich insights from experts on changing markets and new customer engagement technologies to help you go beyond disruption. Learn how to deliver great customer experiences, simplify your processes and systems, and how to transform with agility. Register here. Because no one likes the security line at the airport. And, in the disruption economy, time and team are the two most powerful tools you have. With Digital Summit, you can attend with your whole team, or pick and choose the sessions you want to watch, regardless of where you are. It’s a modern event for a modern marketplace. Whether you’re running the business or configuring a system, we have something for you. We’re building the SAP Hybris Digital Summit for anyone who believes that engaging the customer is the path to winning the market. We promise that this will be rich and relevant with keynotes, panels and presentations streamed live from around the globe. 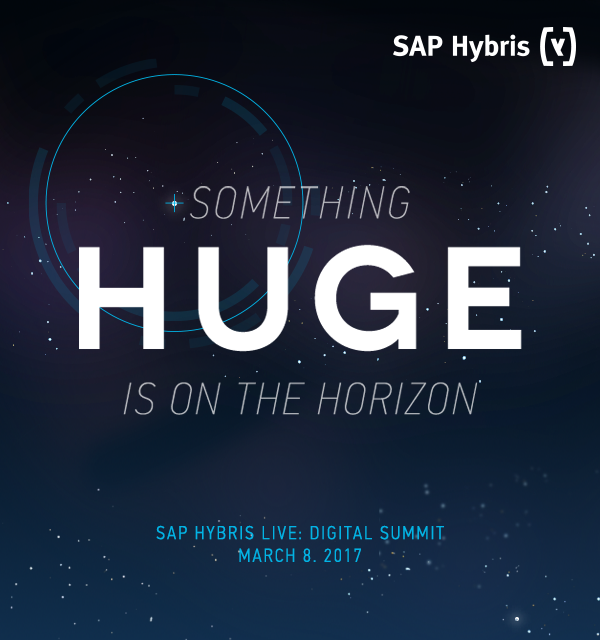 The SAP Hybris Digital Summit will also feature live Q&A with experts and a large library of on-demand sessions. I saved the date, thanks for the invitation. How much “yC4C” will take place? Or only the “large” Hybris family? Hello Julian, I will reach out to a subject matter expert, who will reply to your question asap. Thanks for your patience. The agenda for the summit will be made available this week (Week of January 9th) and the registration link will be made available in mid-January. The agenda and registration link will be accessible via the event hyperlink above. We look forward dto your attendance! The Agenda is LIVE for the SAP Hybris Digital Summit. Check it out! We will be broadcasting live from Singapore, Munich and New York – March 8. Switch between the three locations from the Focus Area filter. Choose the location of your choice, and explore the different sessions we have prepared for you. View the full agenda. Also, how do the on-demand sessions work? I can see them in the agenda list but I cannot add them to my playlist or mark an interest on them or something like that… will they only be accessible during the summit? I have reached out to a Hybris colleague who will get back to you asap. The live sessions will be recorded and posted after the event. The on–demand resource library will go live on March 8th. Once registered , you can access all content both live and on Demand starting March 8th.